For the past 16 years, Billy D's has been serving up the best food in the Delaware Valley. From traditional meals like roast beef and potatoes to our award-winning barbeque, Billy D's uses only the best ingredients. We prepare everything from scratch, so you can be assured of the finest, freshest food you've ever tasted. Our barbequed meats are slow cooked using appple wood. Apple wood lends a sweet, savory flavor to beef, poultry, and pork. Our own recipe "Billy D's Bar-B-Q Sauce" complements our meats. And our delicious side dishes, prepared from scratch, are the perfect complements to any main dish. Our traditional catering offerings are prepared with the same care, attention, and patience as our barbeque offerings. We use the highest grade ingredients and our own recipes to create a meal that will help make any event special. Billy D's will customize our menu to suit your special event, whether it's for a backyard barbeque or an elegant dinner party. 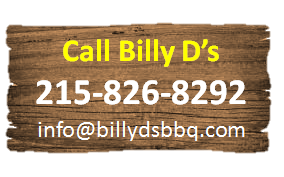 See why people love Billy D's Bar-B-Q. Call Billy D's at 215-826-8292 and tell us what you need. We'll create a menu that's sure to please both the palate and the pocketbook!